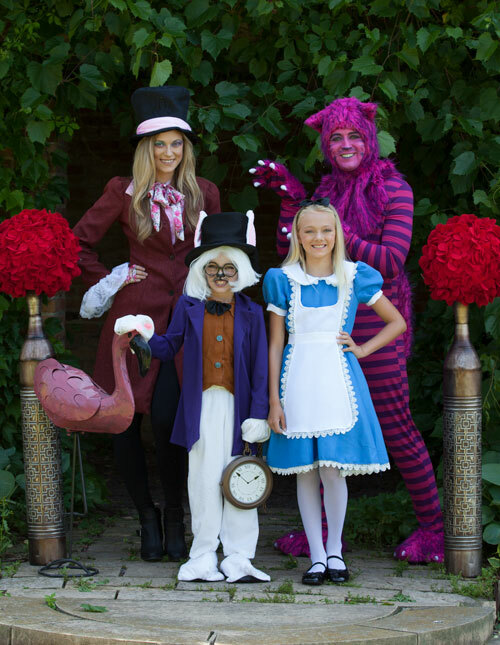 Become the philosophical cat from the Alice in Wonderland storybook in one of our unique Cheshire Cat costumes. A unique character indeed, Alice would often remark that she had many times seen a cat without a grin, but never a grin without a cat. 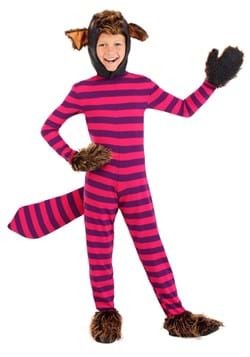 This famous character is worthy of being replicated, and now too can recreate his slinky and sneaky look with our selection of male and female Cheshire Cat Halloween costumes! If you’ve ever been on the internet, you’ve no doubt run across a cat being utterly adorable; be it yawning, meowing, jumping, or “speaking.” That’s just what they do. They’re adorable all the time. Loving cats isn’t a new, modern phenomenon (okay, LOLcats is, but we digress) because, if you really look into it like we did with our epic Googling skills, cat love goes way back to ancient Egyptian society. They practically worshipped cats! Hemingway loved them so much he bred them and there’s still mitten kitties hanging out down there in the Florida Keys living an enviable life even to us humans. So, as you can see, cat fascination goes way, way back. They’ve inspired so many authors and artists, it’s no wonder some of our favorite pop culture characters are actually felines. Lewis Carroll, writer of Alice in Wonderland, knew how enigmatic a cat could be, and that’s why his enduring character, the Cheshire Cat, was just that. The Cheshire Cat is a character that has had so many variations and renditions: from stage plays, to animated films, to live-action films, to the (of course!) classic Tenniel illustrations that were in the original books, that there’s so many different looks you can choose from. He is a character that people still love and love to become to this day. 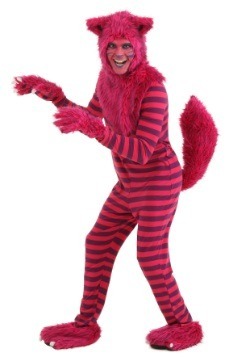 Whether you’re looking to don the mysterious persona of the Cheshire Cat for a play, or for Halloween, we have lots of great ideas on how to get the most out of your Cheshire Cat Halloween costume. 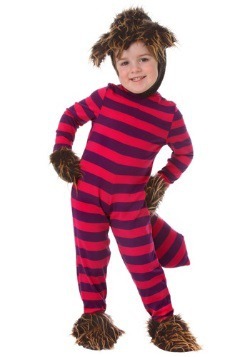 No “this way, that way” here, oh no… it’s right this way to Cheshire Cat costume ideas, no tricks! 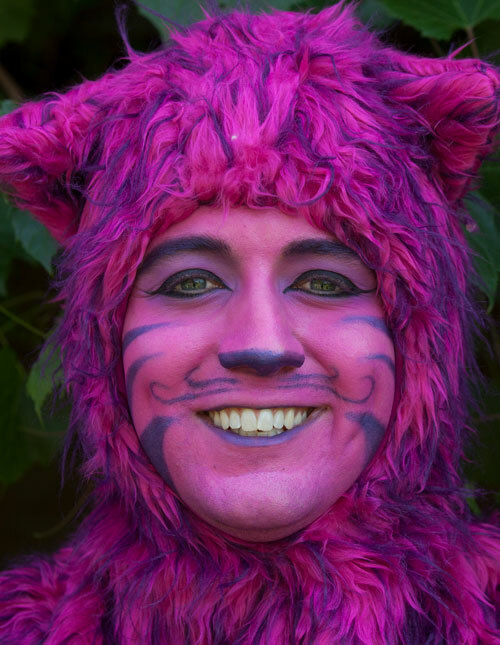 This makeup tutorial is a fun take on the Cheshire Cat character that is sure to put a smile on everyone’s face. Start by applying the bright purple eye shadow to both eyelids followed with a darker purple along the outsides to create a contour shape to the eye. Add liquid black eyeliner, mascara, and bright pink blush for even more flair. Then line the lips with the magenta lip liner, extending it out further to create that trademark smile. 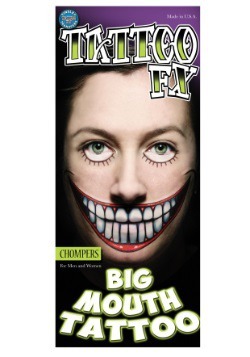 You can create teeth marks across the lips using the same color and then fill in the gaps with a pink lip liner. When taking pictures you want to try and strike the right pose, something that captures the essence of the character you’re portraying. 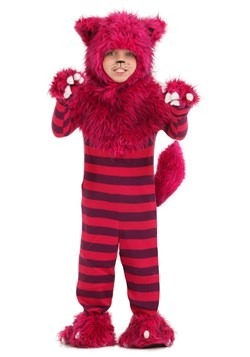 This could be anyone or anything, but in this case you’re going to be the Cheshire Cat. Great choice! Now, we’re going to assume you can’t evaporate select body parts at will like the magical storybook character can, so those kinds of moves are off the table. However, you can totally strike a mischievous look while someone takes your photograph. 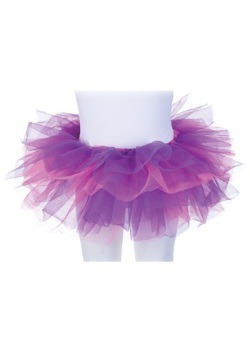 These are the ones that people will love, because they communicate much more than just a costume. They communicate a total transformation! 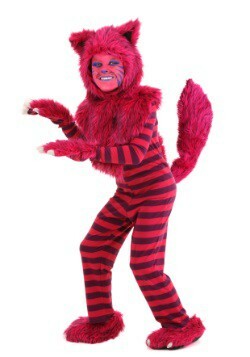 Here is our Cheshire Cat outfit in full. As you can see it’s striped from head to toe, and has some furry accents to give a textural shake-up, making it even more eye-catching. 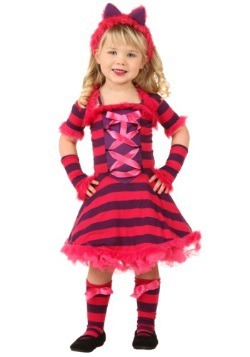 You wouldn’t think you could get more eye-catching than bright purple and pink stripes, but this costume does it! As for a pose, show off your “claws,” and don’t forget to smile! 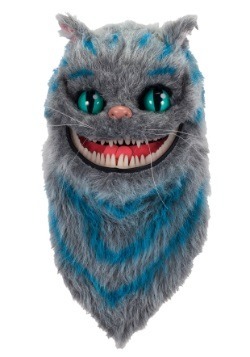 Even when bearing his claws, the Cheshire Cat will definitely be smiling. When you’re with a group, a great pose idea is to pop out from the side of the frame somehow to look like you’re surprising the rest of the group. You could jump out of pretty much anything—from behind a tree, from behind a bush, from behind a doorway… whatever you have! We took these at a very cool vine-covered house, and as you can see the pose works great along with the setting to give that Wonderland vibe. We assure you we didn’t actually go there; you too can find this kind of thing where you are to really get those fun and memorable images. The Cheshire Cat, characteristically, will show up anywhere in an unexpected way. Our Cheshire Cat model has taken a fun seated pose, with crossed legs, waiting for an Alice to finally show and hear some loquacious riddles. We like the seated look because it’s definitely out of the ordinary and has a “been there, done that” attitude that is just perfect for this apparition animal. Give it a shot this Halloween, but watch where you sit, because you wouldn’t want to get your costume dirty. Beware! 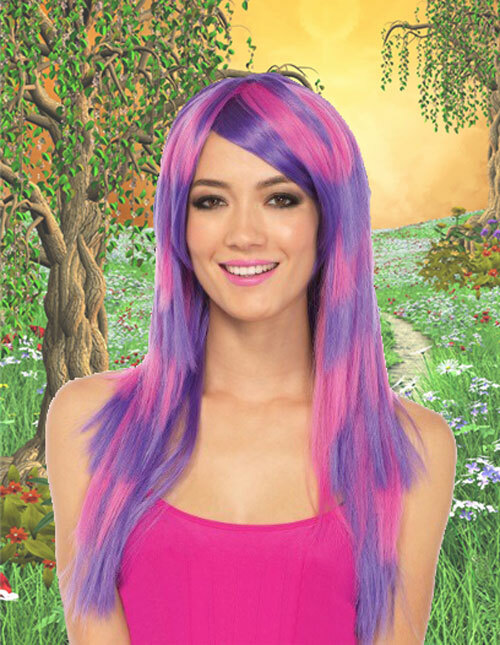 No really, people are going to love this costume as much as you do. It looks great! As you can see, it has a little tail in the back of the skirt, and all the accessories have really come together to make it a Wonderland wonder. Our model is striking a fun pose here, looking over the shoulder right into the lens of the camera. We like this because it’s a little sassy, and there’s nothing wrong with the Cheshire Cat being a little sassy. In fact, we say it’s preferred! It’s no accident that people who love fairytales, crazy characters, and anything off-the-wall end up finding each other. Honestly, it’s a great thing that they do! Because how boring would the world be without them? We have some really fun group ideas in the photos below to show off your family’s sense of humor and broad interests. 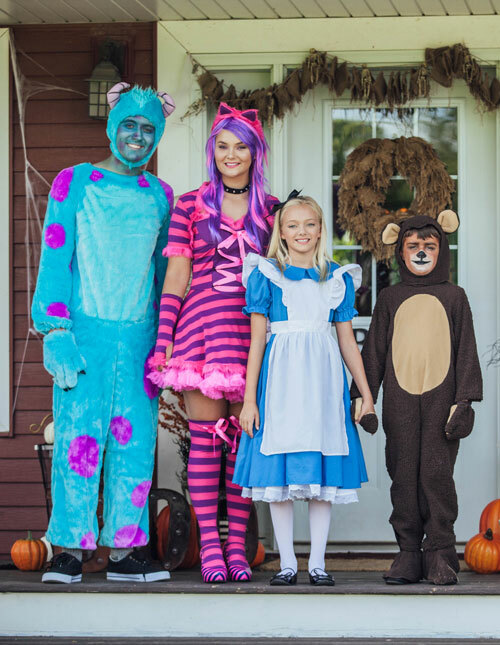 The Cheshire Cat is there, of course, but so is Sulley the monster, Alice, and a bear! Keep your eye on that bear, by the way, he’s got a real honey problem. This family is all about the individuality. See, you don’t have to all match to make the most out of your look. We love the idea of everyone choosing who they want to be and going for it. In some ways, the colors all go together and it all works out. 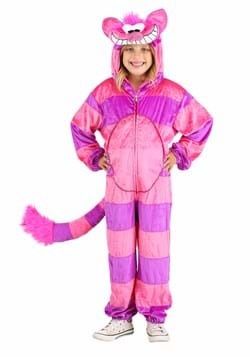 Cheshire Cat goes with our Alice in Wonderland costumes, but if Dad isn’t all about being the Caterpillar or the Mad Hatter, he can become the friendliest monster from Monster’s Inc. If junior doesn’t want to be Tweedle Dee, he can be a bear! We say, let them choose and you’ll have a happy Halloween. If you somehow get the wave of family harmony under control and everyone decides they want to be on theme, there’s nothing wrong with that, either! We love a great group coordination effort on the part of a whole family. Here dad is getting in on the Alice in Wonderland cat fun. Mom is rocking the Mad Hatter look, and even the youngest girl found her perfect counterpart in the White Rabbit. We used a few props to really make this photo pop. The bright red is reminiscent of painting the rose bushes right outside the Queen’s infamous hedge maze. The fun is obvious with a group like this. When you put on a costume, you can’t just let that be that. You’ve got to accessorize! It’s part of making the most of your look. 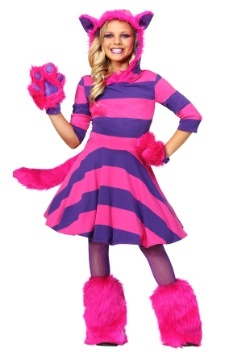 When you’re the Cheshire Cat that can mean adding furry mittens, a wig, make-up, or many other things that make your costume truly stand out (which is tough to do when you already come from Wonderland!). 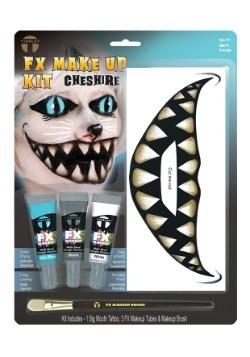 Try out any of our Cheshire Cat costume accessories here and we guarantee you’ll have a big wide grin that wasn’t just painted on. 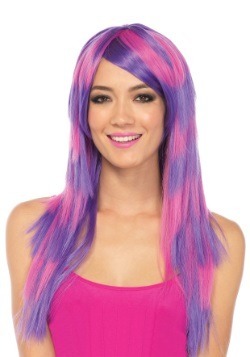 What a wig! 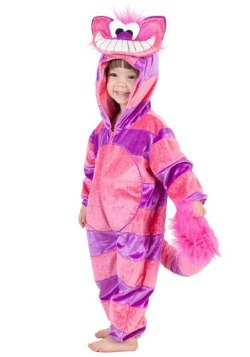 It’s really the perfect thing to go with your Cheshire Cat costume, because it matches the colors, and we don’t think you can get anymore whimsical than this. It’s long, past the shoulders, and it’s got pink and purple stripes throughout. Wear it with some ears and you’ll be hard to miss. It’s very easy to forget about the shoes, but we implore you to take a look at these gorgeous pumps. They’re made of high quality materials so they’re definitely not going to fall apart on you after one night of Wonderland partying. 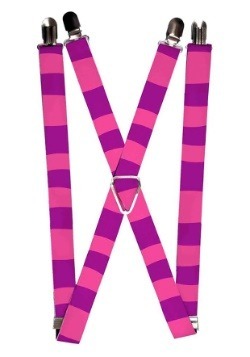 And as far as aesthetics, they’re made to go with your costume perfectly, featuring a dark purple base and pink stripes along with a pink ribbon over the strap. 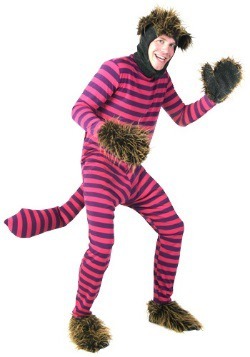 No, we’ve never seen the real Cheshire Cat wear anything like these, but if you’re looking to really put your look over the top into Classy Cat milieu, then this is what you need, no doubt. 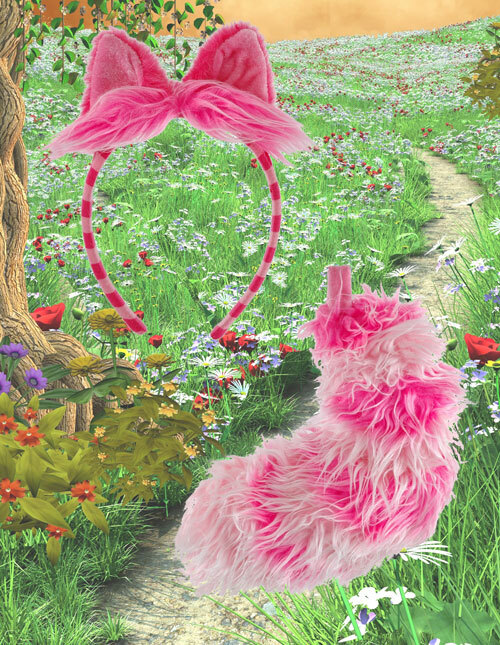 It seems like a simple thing, but this Cheshire Cat ears and tail set is really a must have for anyone going as the mysterious feline. 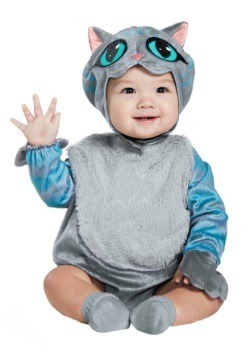 This set comes with an ears headband, with a little bit of mussed fur on the top, as well as a big bushy tail that can clip on the back of your costume. It’s evocative of the animated version, and even if your costume already has these things, perhaps you just want a fluffier version. If that’s what you’re looking for, then there’s no more this way or that way about it—you’ve found the right item! Okay, this isn’t quite an accessory, but it does have a hood! 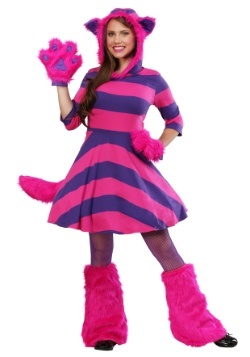 There’s nothing wrong with keeping it cool and casual this Halloween with our Cheshire Cat hoodie dress. 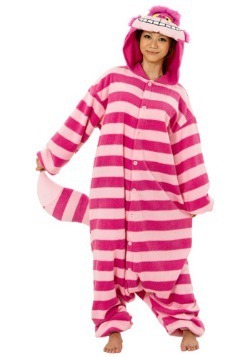 This hoodie is striped and zips up the front, and even has a character hood with ears. You can wear this for the season, to Disneyland, or anytime! It’s a versatile little thing, and it’s comfortable to boot. 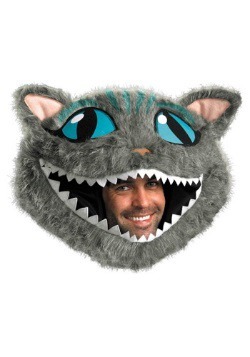 We think the Cheshire Cat would totally approve. 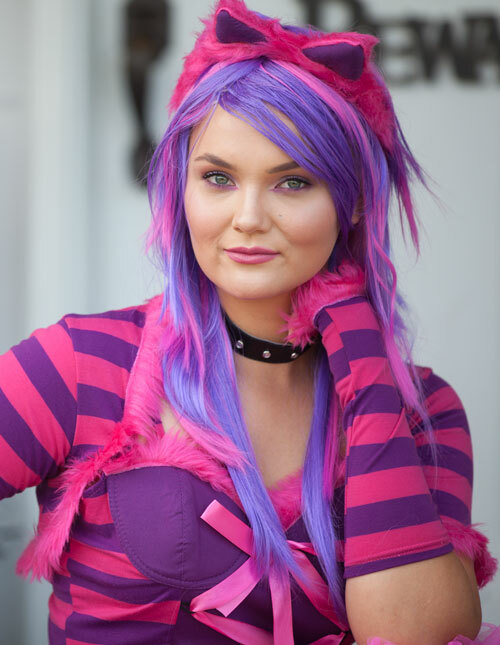 Our Cheshire Cat dress has all the stripes you could ever want in purple and pink colors. There’s a great ribbon “corset” effect on the chest, and lots of fluffy tulle to give it a lot of volume. 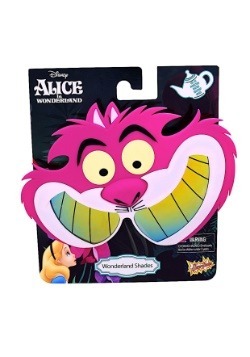 When you add some of our accessories you’ll feel like you really became the Cheshire Cat. We’ve taken our photos here on a Halloween themed porch (hey, we are a Halloween company after all!) but you can take some great photos just about anywhere, especially at a park or other woodsy area. Unless you know how to get to Wonderland to take some pictures, a nice little forest area will have to do! 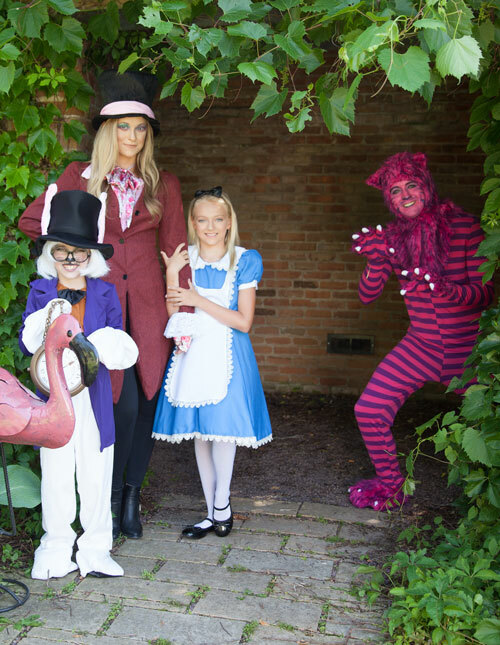 Again, we’re on our spooky Halloween porch for this one, and our Alice in Wonderland Cheshire Cat costume really stands out! A nice drab, fall background actually helps this dress pop even more. It’s so colorful and has such an eye-catching design that standing out isn’t difficult. We like this model’s pose because it’s fun, nonchalant, but undeniably cute. Looking away from the camera is the perfect way to give a little mystery to any photo. Try using this pose and we guarantee you’ll inspire at least a few Cheshire-style grins. Always get a close-up! They’re very important when you’re working on upping that Instagram game. So far we’ve shown you all full-body photos which are also equally important to showing off your full costume look from head to toe, but don’t forget to show off all the work you put in with details. 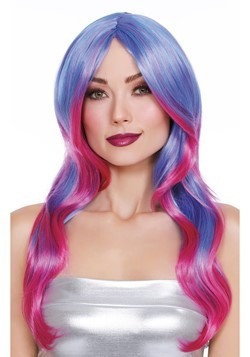 This includes the hair (especially if it’s a matching wig like this one) as well as make-up, and accessories that won’t be captured from afar. We want to particularly point out these lovely cat ears as well as the subtle purple eyeshadow to coordinate with the purple in the costume. 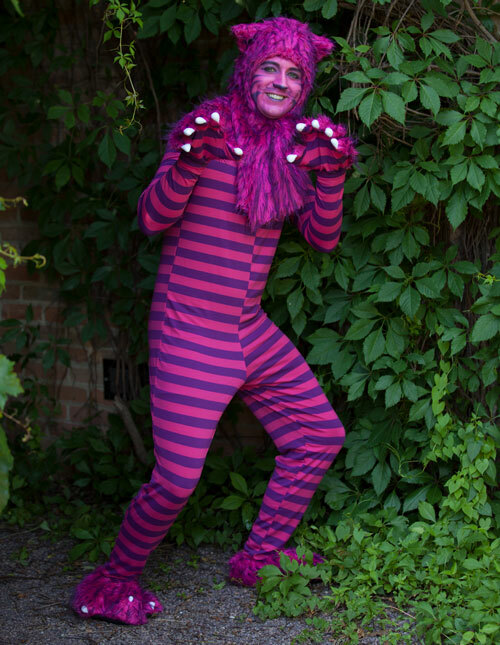 Speaking of close-up, here is our next male model truly loving his look as the Cheshire Cat. We’ve got a bit more make-up than on the last one, which goes really well with the jumpsuit style costume to really solidify it. The make-up, as you can see, has stripes up the sides, a matching cat nose, whiskers underneath, and even purple lipstick! 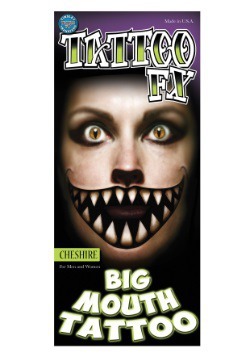 This should really put your Cheshire Cat look over the top, and all you really need to after that is provide your own big toothy smile.